Building a carriage house plan is a practical home addition, and they are becoming more and more popular given the conditions of the present economy. Discover some of the top reasons Americans are building carriage houses. Families are outgrowing their homes and need more living space. Families need more parking space, especially those with up teenage drivers. Growing families do not have the finances to upgrade to a lager home or build a brand new home, but can afford a smaller construction project that will provide much needed living area. Families love their neighborhoods and don’t want to move but need extra room. The family handyman needs a workshop. Some homeowners need extra storage space for basement and attic overflow or large and bulky items. Homeowner’s desire a guest suite that provides all the comforts and privacy of home for frequent weekend visitors. Some homeowner’s need a place for aging relatives to have the privacy of their own home with the opportunity to seek immediate assistance if necessary. The work-at-home parent desires a home office that provides peace and quiet and the ability to visit with clients without disturbing the rest of the home. Home-based business owners want a private place to work and meet with clients without actually leaving home. Parents need additional housing for college students who require privacy and independence, but still need parental guidance from time to time. Homeowners want to add a craft area, hobby room, music room or exercise area, but don’t have a basement or enough room in the basement to add one. Grandparents are looking for a place for grandkids to stay when visiting for the holidays without having to listen to loud music or be disturbed when the grandkids come home in the wee hours of the morning. Parents are looking for a place for boomerang children to stay until they get back on their feet. Families may need living quarters for the nanny. Owners of large estates may wish to provide living quarters for the maid, groundskeeper, etc. Families need room to relax and often use the apartment for a playroom, home theater or game room for everyone to enjoy. They may even use it for an entertainment space for guests. Growing families are looking for an additional source of income and rent the living quarters to tenants. Garage apartments make nice temporary living quarters while the main home is being constructed and easily convert to a guest house when it is time to move into the main home. Outdoor adventurists, nature enthusiasts, hunters and fishermen may not build a garage apartment in the backyard at all, but rather near their favorite lake or in the woods using it as an alternative to a vacation home, weekend retreat or hunting and fishing cabin. If you are interested in viewing carriage house floor plans, take some time to browse The House Plan Shop’s extensive collection of designs from North America’s top rated designers. Building a House: Where to Begin? Have you found yourself asking, “I want to build my dream home, but where do I start?” If so, you’ve come to the right place. There is a wide range of resources available to help you get started on your home building project. Most of these resources are easy-to-access and will offer insight and knowledge about the construction project you are about to tackle. Below are just a few of the house building resources available to you. Talk to family members and friends who have built a home or completed another residential construction project such as building a garage. These people will speak from experience and have a wealth of knowledge to share. Ask them what worked, what didn’t go so well, what that would have planned better and what things they would do differently if they were to build again. Spend some time talking to professionals at local lumberyards. These people are especially knowledgeable about building materials. Take time to check with your local building department or building inspector. Find out what is required in your city, town or municipality for new home construction. Ask about building permits, building codes and other regulations you’ll be expected to follow. Contact local building professionals that have experience with residential construction and ask lots of questions. Some of these people include builders, contractors, residential designers, carpenters, electricians and other various professionals. If you need to get a loan, check with various mortgage lenders. Find out what steps you need to take to qualify for a loan and what the lender expects throughout the lifetime of the construction loan. Use the Internet. There are all sorts of construction and building websites that offer a wealth of information about the building process from beginning to end. 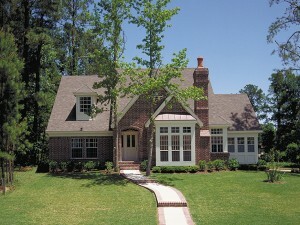 Don’t forget about The House Plan Shop! We have an extensive resources page with many articles and tips to help you through the home building process. Also, you can follow us on Twitter and check out our Facebook page for current postings about building a house, residential construction, green building and other related information. Are you looking for a county house plan with the look and feel of an old farmhouse but modern enough to satisfy your modern-day family’s needs? 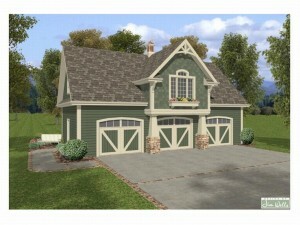 Check The House Plan Shop’s featured design! 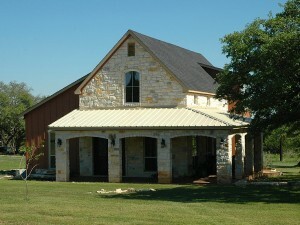 The exterior boasts old-fashion farmhouse styling with its metal roof, stone façade and covered porch. Inside you’ll find a floor plan well suited for an active family with a few special extras. The first floor enjoys a spacious great room anchored by a stunning corner fireplace. A two-story ceiling lends an airy touch. The gathering area connects with the dining space creating an open floor plan flexible enough to handle everyday happenings and special get-togethers. Efficient and practical, the kitchen offers a step-saver design and a snack bar for quick meals on the go. Also, it is a good place to help the children with homework as you prepare dinner. Nearby, a half bath and the laundry room offer convenience. Your master bedroom spans across the back of the home. Double walk-in closets offer plenty of storage space, and the refreshing bath is sure to soothe you at the end of a long day. The second floor is reserved for the children’s rooms. Two bedrooms delight in walk-in closets and share a full bath. Ideal for family living, this two-story country home plan is sure to turn some heads. View more plans by this designer or browse our entire collection of country home plans.